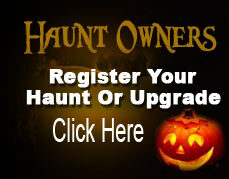 Also seen on the Travel Channel show- Halloween Crazy! and Toy Hunters. The Dent Schoolhouse takes place in a schoolhouse that was built back in 1896 and contains a gruesome legend... The Janitor of the school, Charlie McFree is said to have killed a large number of the student body over a period of 10-20 years. Hiding their bodies within the basement, the smell became too much and alerted the town of Dent... discovery of the hellish scene has made a permanent residence in the basement. The building is said to be haunted by both the lost children... and The Janitor! Every admission ticket includes admission to The Dent Schoolhouse and Detention Hall. In Detention Hall... it is up to you to find your way out of this haunted maze! LIGHTS OUT - ONLY on November 1st – 3rd. Back by popular demand! Experience the schoolhouse in a whole new way! Travel through the schoolhouse with almost all of the lights out!!! The TOUCH Pass is back for 2018… yes the Dent monsters can touch you if you choose to purchase the TOUCH pass. LIGHTS ON TOUR FOR 2018 - From 4pm -7pm Sunday, October the 28th! Experience the schoolhouse with the lights on! This is a great way to introduce a little one to Halloween or just to see all of the detail that the old schoolhouse has to offer. There are no actors inside so you can go through at your own pace. Plus- grab fun goodies and prizes along the way from some of our friendly ghouls! New for 2018! December 7th and 8th. Experience what it is like to celebrate Christmas at a haunted house! More details will be posted after Halloween.